Using Visual Art as a platform "Portraits of Autism" seeks to create social awareness while opening up a discussion about available support systems and funding for families caring for both children and adults diagnosed with Autistic Spectrum Disorder (ASD). The focus of each portrait is to bring awareness to autism as well as to provide an emotional experience and public connection to each subject as a unique individual who is not only defined by their “disability”. According to recent statistics Autism is the fastest-growing developmental disorder in the US. About 1 in 59 children in the U.S. has autism, according to data released April 27, 2018 by the U.S. Centers for Disease Control and Prevention (CDC). Although there have been significant advances made in recent years, there is a tendency in our society toward a lack of representation or misrepresentation of people with disabilities in the media including the arts. Where the media holds a high level of influence over the perceptions of the general public, an under-representation or mis-representation of disabled people has large social implications. The immediacy of an image can convey information rather quickly giving concrete shape to something that might other wise be intangible. The portraits relating to this project are large scale oils on canvas currently ranging in size from 36x48” to 48x60” and are based on imagery provided as reference material by each family through social media sources or other forms of communication. Each series of portraits are part of a larger narrative including writing, editorials and poetry written by the subject, family member or caregiver. The story is told on a continuum through their experience. The project follows each family as they continue to make individual decisions on what is best for their child's future - often with very limited resources. For many families raising a child on the spectrum there is a persistent fear and concern for their child’s future. This becomes increasingly disconcerting as parents begin to look at the reality of what may happen when they are no longer alive or become incapable of caring for them. Small children are the public face of autism, their appeal helping to win public understanding and educational support. Will there be public support for them as adults? Eddie at Five, 2017 Oil on canvas 42x54"
Eddie (Age 48) lives in Friends of Good Shepherd Manor a residential care facility in Lucasville, Ohio. Originally a Catholic facility, it is now privately run through funding from Medicaid. Eddie’s older sister Lynette recently has taken guardianship over Eddie as his parents enter their later stage of life. How do you live with an adult child who has profound developmental disabilities? To try to answer this question, I must look at what brought me here. I prefer to look at the past in stages. The first stage is the diagnostic stage. Born a beautiful little blonde boy, we thought he was perfectly normal. After a few months, we suspected this was not to be true. So began the search for diagnosing. After almost a year and a half of searching for answers, we finally learned he had Autism. It would take us many more months to fully realize the extent all that this meant and the impact it would have on our family. So began, “ living with and loving this sweet boy who has many limitations and accepting him as he is” stage. Hours of entire family teaching him most basic skills was challenging and, at times, frustrating. Although, he never learned verbal skills, he has learned to feed himself, became potty trained and learned some basic control over his own environment, many times while screaming in resistance. Left alone, he could entertain himself for hours while sitting on the floor and spinning a plastic bowl, or just screaming. He did not like to be touched or held, but we continued to try because we all loved him. Eventually, he began to understand ( I think ) that we were going to continue to touch and hold him , so we started into his routine - touch and hold me on my terms and when I want you to. Life became easier. “special school“ from 4 years old until he was 22, when he could no longer attend school in our state. Things went relatively well until he reached puberty. At 13 he began having seizures ( some life - threatening ) and his behavior became very violent at times - hitting, screaming, knocking pictures off walls, putting holes in walls, turning over furniture, and going many nights without sleeping at all - at times, screaming all night. We found a Doctor , who, after years of searching for the right medications to control seizures and behaviors, he found the right combination. At 21, when the seizures were mostly under control, the behavior improved and he once again was our sweet boy. When he could no longer go to school, and I had my terminally ill Mother living with us, and the 2 older children were grown and away from home ( they were wonderful with him and so helpful ) I began the next stage which was looking for services again. Ed lives in a specialized facility now and seems happy and content where he has lived since he was 23. It is a beautiful home which he shares with 7 other residents. We moved closer to him so we are able to visit and bring him home on a regular basis. Although, Ed does not talk or show much facial expression , when he gives us a hug and allows us to hug him for a brief moment, the love that we have for him is almost overwhelming, knowing all the struggles we had to conquer to get here. The present stage is the last stage for me, what will happen to him once I am gone? Hopefully, he can stay where he is, but there are no guarantees. I do not expect the 2 older children to monitor his care as I have, as they have already spent many years sacrificing their parents time and attention while growing up. We all became experts at taking turns. But they will because they love him and want for him the best life he can have. The final stage, with all the struggles and frustrations which come with all the other stages, may be the most difficult yet. Although he’s in a good place , we wonder what he will think when he no longer gets to come home or see us. But we have to leave all that to “ whoever watches over those who can not care for themselves.” Hopefully, he will always know how very loved he is. 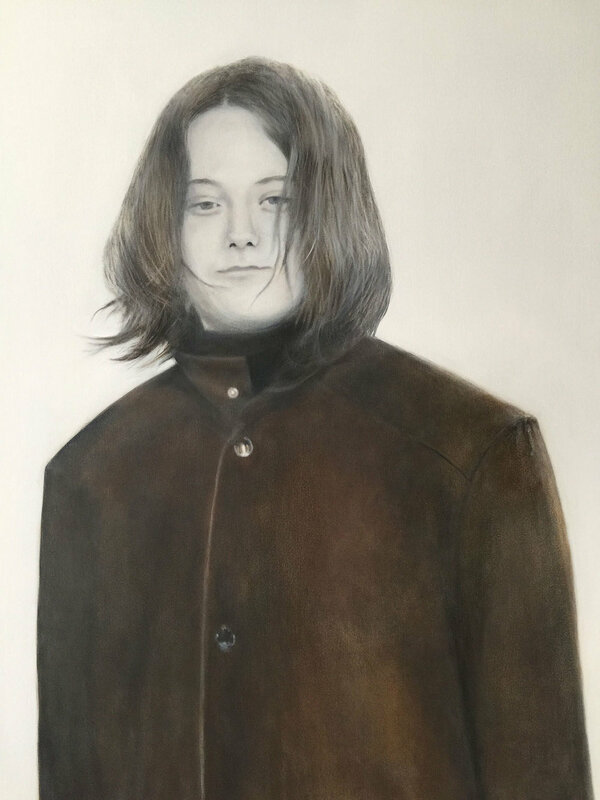 Keir at Ten, 2017 Oil on canvas 42x54"
Keir Born January 2, 1992 (Age 26) is cared for by his father in the family’s home with support from the state programs available in Madison, Wisconsin. Scot, Keir’s father, is paid a minimal amount by the hour for a set number of hours per week to provide care for his son in the family home. Because of Keir’s aggressive behavior, Scot is the only one physically strong enough in the family to care for Keir’s needs. Ruby, Keir’s mother cares for their young adult son Aticus who is also on the spectrum. For many families the option to send their autistic child to a group home or some other type of institution (if even available) is heartbreaking and not an option they are willing to consider as their child “ages out” at 21 when access to Federally mandated funding is discontinued. You did not choose to be this matador. The stadium surrounding our lives together is all din and glare. Medicine and science prance around the ring like feeble picadors. For us no glory in the bloodied sand beneath our skittery feet. But at times your dance and sway distracts the relentless bull. You are the grace of angels and the power in purity. The red cape will always bear my name. And when push comes to hug we will stand together. In the end, that may be enough. One day the bull will charge no more and we will toss our hat to a cheering crowd. Finn at Nine, 2017 Oil on canvas 42x54"
Finn Born September 24, 2007 (Age 11) was excepted into a residential placement (age 10) at The New England Center for Children a school for children with autism located 20 miles west of Boston in Southborough, Massachusetts. Finn's mother Alysia, father Jeff and older sister Annabel (age 13) visit Finn on a weekly basis. “Portraits of Autism” follows Finn and his family as they embark on this new chapter. An open letter to our local diner: Thank you for welcoming our autistic son. Buhdda at Ten with Service Dog Mouse, 2017 Oil on canvas 42x52"
Buhdda (Age 11) lives in Idyllwild, CA with his mother Kaarin Elizabeth, his service dog and his two older siblings Wolfgang and Elizabeth who are also on the spectrum. Buhdda is non verbal and uses two word sign language and an Ipad to communicate. He attends a program through Barista Creek Elementary in Hemet, CA. And, goes to the top of my neck. He would not be able to stop himself. To throw books, to hit things, to hurt people. Not even the doctors and their precious machines. But I see it, I know it, I live with it, I have made it my own. Still didn’t quiet the lightning storm in his head. Because it meant he was finally exploring. Making sure I complimented him on such unique and imaginative art. Trying to tell them, with no accessible words, that he hurts too. Who finally found the word Autism. That I refuse to give up on him. And that he can’t tell anyone, because that is what nonverbal means. Wolfgang at Eight, 2017 Oil on canvas 36x48"
Wolfgang (Age 12) lives with his mother Kaarin Elizabeth and his two siblings Elizabeth and Buhdda who are also on the spectrum in Idylwild, CA. Wolfgang is the middle child. Son of Kaarin Elizabeth and Michael C. Diaz Jr.
Elizabeth at Fourteen, 2017 Oil on canvas 36x48"
Elizabeth (Age 19), lives in Idylwild, CA with her mother Kaarin Elizabeth and her two younger brothers Wolfgang and Buhdda who are also on the spectrum. With a love of numbers and a prodigy in guitar, at age eleven Elizabeth received a scholarship to attend Idyllwild Arts. She was diagnosed with ASD at age 14. Elizabeth is transgender. Born Kubrick, at the age of 17 she changed her name to Elizabeth and is in the process of seeking access to hormone therapy. Due to her high level of social anxiety she hopes to be able to work from home and is currently taking on-line classes in accounting. Many children with autism spectrum disorder (ASD) are diagnosed in early childhood. But for others, the signs might not be as clear. It might not be until they’re at primary school or even secondary school that the question of ASD comes up. During these years, social and behavioral differences can become more obvious as children respond to the social and educational challenges of school. Some children with ASD grow up without their condition being recognized. It's never too late to get a diagnosis. August at Ten, (Work in progress) Oil on canvas 42x52"
"It’s good because I can get help with life. When I grow up maybe the government will help take of me. I think people who don’t know me hate me because I act crazy sometimes. Sometimes I punch my mom. I like being autistic because I have a therapy dog who is nice to me. His name is Duke. I love him so much. We are buddies and he’s cute. His feet stink." What’s hard about having autism? "People are mean to me. Sometimes I don’t understand things." What do you wish people who don’t have autism knew about you? "I am funny. That’s what other people tell me. I get angry a lot because people are not nice to me." What’s your favorite thing about this painting? Autumn at Nine Work in progress Oil on canvas 42x52"
Autumn (Age 9) lives in Westfield, MA with her mother Yvette and father. "Autumn was diagnosed with Autism and Hyperlexia at 3 years old. We noticed something was different when she could read better than she could talk, which lead to her reading her first book at 21 months. Later, we noticed speech and communication delays that put us on a path to a diagnosis." Although autism is more prevalent in boys, girls often fly below the radar and are diagnosed much later in life. Girls may be quick to “copy” social interaction in an attempt to “fit in” with their peers. New research also suggests the disorder often looks different in females, many of whom are being misdiagnosed and missing out on the support they need because the research has focused on boys. (Age 19), lives in Madison Wisconsin with his Mother Ruby, Father Scot and Older brother Keir who is also on the spectrum. Atticus was diagnosed at around age 10 with *Aspergers and OCD. *Asperger syndrome is one of several previously separate subtypes of autism that were folded into the single diagnosis autism spectrum disorder (ASD) with the publication of the DSM-5 diagnostic manual in 2013. Asperger syndrome was generally considered to be on the “high functioning” end of the spectrum. Affected children and adults have difficulty with social interactions and exhibit a restricted range of interests and/or repetitive behaviors. Milo (age 21 ) from Los Angeles, CA is currently a Junior at UC Berkley majoring in Computer Science and Math. Milo receives support from Berkley's Disabled Student Program where he is learning to advocate for himself. The Disabled Students' Program promotes an inclusive environment for students with disabilities. The program equips students with appropriate accommodations and services to achieve their individual academic goals and is dedicated to supporting students and collaborating with the campus community to remove barriers to educational access and embrace the University’s values of equity and inclusion. The program operates under the belief that "an accessible environment universally benefits everyone." Milo presented with Hyperlexia teaching himself to read by age 3. With encouragement from Milo's grandmother, teachers and other parents - Milo's parents Ceilia and Chris who were hesitant to accept a diagnosis of Autism took Milo for testing at age four when he was officially diagnosed with Autism. Milo attended Cheerful Helpers Child and Family Study Center a therapeutic preschool for ages 2 through 7. The experts there were able to bring Milo out of his solitary world where he was able to participate in activities with his peers. Established in 1958, the Cheerful Helpers Child and Family Study Center provides services to families with young children, ages 2-7, who are having difficulties with social and emotional development, including delays in speech and language, sensory-integration, motor-planning, self-regulation and socialization. Their family-oriented, relationship-based intervention programs are for children with high-functioning Autism Spectrum Disorders, attachment disorders, developmental delays, and processing, learning and emotional difficulties. The Center operated for 49 years in the Thalians Department of Psychiatry at Cedars-Sinai Medical Center prior to moving to its own home in Fall 2007. Cheerful Helpers remains the only program in the Los Angeles area that helps children with special needs by treating the entire family. After graduating form Cheerful Helpers, Milo’s teacher suggested that Milo start 1st grade at The Frostig Center in Pasadena. The Frostig School offers a full range of academic and support services for children in grades 1-12 who have been diagnosed with learning disabilities such as dyslexia and dysgraphia, ADHD, and/or Autism Spectrum Disorders (High Functioning Autism, Asperger’s and Pervasive Development Disorder). Milo’s parents explained to him that, while he didn’t have a learning disability, his disability was that he had a hard time making and keeping friends. Milo was able to move on after the 5th grade, as his academics were well above grade level. The therapists at Frostig recommended Bridges Academy in Studio City, CA as the best fit for Milo. Bridges Academy is known for being a “2e” (twice-exceptional) school. The term “twice-exceptional” (or “2e”) often is used to describe students with high ability and potential who simultaneously experience learning, executive functioning, production, and/or social challenges. They are challenged in most schools by a misalignment between their learner profile and the school's curriculum and instructional approach. The students are exceptionally bright but would have difficulty getting individual attention for their learning challenges in a public school setting. Milo is proud to have Asperger's and feels confident that he will be able to get a job after graduating from college and live independently. Portraits of Autism focuses in part on relationship, connection and methods of communication. In order to relate to a person with autism one must set aside all preconceived ways of “typical” social interacting. Because of the Americans with Disabilities Act, we have seen significant changes in our environment. As a society, we have gotten comfortable with the idea of accommodations for people with physical disabilities. For people with extreme behavioral challenges of autism, society is almost at a loss as to what to do for them. One third of children with autism never speak, only making grunts and high pitched sounds. It is a misconceived belief that by the time a child with Autism reaches the age of 21 they will smoothly make the transition into adulthood without special guidance and continued support. For many families the option to send their autistic child to a group home or some other type of institution (if even available) is heartbreaking and not an option they are willing to consider. For others, the often difficult choice to find a residential school or group home is necessary for the well being and safety of the child and family as a whole. As parents age often the role of guardianship for the adult with ASD is passed on to a sibling or other family member. Roughly 500,000 children with autism will become adults over the next 10 years. According to recent statistics Autism is the fastest-growing developmental disorder in the US. About 1 in 59 children in the United States has autism, according to data released April 27, 2018 by the U.S. Centers for Disease Control and Prevention (CDC). Four times as many boys as girls have the condition, according to the report. These numbers show an increase of nearly 16 percent from the previous prevalence of 1 in 68 children two years previous. The gender gap in autism has decreased. While boys were 4 times more likely to be diagnosed than girls (1 in 37 versus 1 in 151) in 2014, the difference was narrower than in 2012, when boys were 4.5 times more frequently diagnosed than girls. This appears to reflect improved identification of autism in girls – many of whom do not fit the stereotypical picture of autism seen in boys.White children are still more likely to be diagnosed with autism than are minority children. However, the ethnic gap has narrowed since 2012, particularly between black and white children. This appears to reflect increased awareness and screening in minority communities. However, the diagnosis of autism among Hispanic children still lags significantly behind that of non-Hispanic children.The report found no overall decrease in the age of diagnosis. In 2014, most children were still being diagnosed after age 4, though autism can be reliably diagnosed as early as age 2. Earlier diagnosis is crucial because early intervention affords the best opportunity to support healthy development and deliver benefits across the lifespan.